PLSOLUTION-XFi GMP-Clinical Grade is a gamma-irradiated and non-xenogeneic cell culture supplement, which is 100% xeno-free and complies the high safety guidelines for clinical applications. Virus panel testing is performed according to ICH and EMA guidelines (ICH Q5A (R1) and CPMP/BWP/268/95). PLSOLUTION-XFi GMP-Clinical Grade meets the requirements of evolving global regulations regarding the reduction of adventitious agent transmission (according to the European Pharmacopeia General Chapter 5.2.12). The human platelet-derived culture supplement is manufactured and gamma-irradiated under GMP conform conditions for safer use in clinical and therapeutical trials. 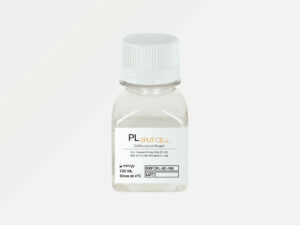 PLSOLUTION-XFi GMP-Clinical Grade does not require any heparin addition in cell culture due to fibrinogen-depletion. PLSOLUTION-XFi GMP-Clinical Grade promotes the cell performance of different human cell types (particularly adult stem cells, e.g. MSCs) due to the presence of abundant growth factors and cytokines. PLSOLUTION-XFi GMP-Clinical Grade is manufactured from platelet units obtained from healthy blood donors at FDA-licensed blood centres. 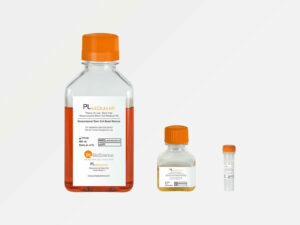 PLSOLUTION-XFi GMP-Clinical Grade is provided in validated Nalgene® bottles in different sizes.